Every user utterance leverages SpeechRecognizer. It is the core interface of the Alexa Voice Service (AVS). It exposes directives and events for capturing user speech and prompting a client when Alexa needs additional speech input. Additionally, this interface allows your client to inform AVS of how an interaction with Alexa was initiated (press and hold, tap and release, voice-initiated/wake word enabled), and choose the appropriate Automatic Speech Recognition (ASR) profile for your product, which allows Alexa to understand user speech and respond with precision. Important: Cloud-based wake word verification is required for voice-initiated products. It improves wake word accuracy by reducing false wakes that are caused by utterances that sound similar to the wake word. See Enable Cloud-based Wake Word Verification for implementation details. Opus is now a supported format for captured audio. For more details, see the specification under the Recognize event. The following diagram illustrates state changes driven by SpeechRecognizer components. Boxes represent SpeechRecognizer states and the connectors indicate state transitions. IDLE: Prior to capturing user speech, SpeechRecognizer should be in an idle state. SpeechRecognizer should also return to an idle state after a speech interaction with AVS has concluded. This can occur when a speech request has been successfully processed or when an ExpectSpeechTimedOut event has elapsed. Additionally, SpeechRecognizer may return to an idle state during a multiturn interaction, at which point, if additional speech is required from the user, it should transition from the idle state to the expecting speech state without a user starting a new interaction. RECOGNIZING: When a user begins interacting with your client, specifically when captured audio is streamed to AVS, SpeechRecognizer should transition from the idle state to the recognizing state. 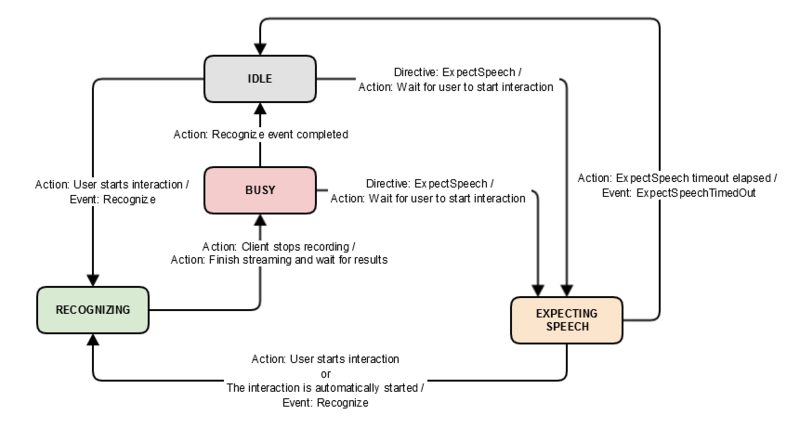 It should remain in the recognizing state until the client stops recording speech (or streaming is complete), at which point your SpeechRecognizer component should transition from the recognizing state to the busy state. BUSY: While processing the speech request, SpeechRecognizer should be in the busy state. You cannot start another speech request until the component transitions out of the busy state. From the busy state, SpeechRecognizer will transition to the idle state if the request is successfully processed (completed) or to the expecting speech state if Alexa requires additional speech input from the user. EXPECTING SPEECH: SpeechRecognizer should be in the expecting speech state when additional audio input is required from a user. From expecting speech, SpeechRecognizer should transition to the recognizing state when a user interaction occurs or the interaction is automatically started on the user's behalf. It should transition to the idle state if no user interaction is detected within the specified timeout window. To use version 2.0 of the SpeechRecognizer interface, it must be declared in your call to the Capabilities API. For additional details, see Capabilities API. Alexa expects all clients to report the currently set wake word, if wake word enabled. The binary audio captured by the product's microphone. Captured audio that is streamed to AVS should be chunked to reduce latency. The stream should contain 10ms of captured audio per chunk (320 bytes). A StopCapture directive is received. The stream is closed by the Alexa service. The user manually closes the microphone. For example, a press and hold implementation. The profile parameter and initiator object tell Alexa which ASR profile should be used to best understand the captured audio, and how the interaction was initiated. Important: If your product is voice-initiated it must adhere to the Requirements for Cloud-Based Wake Word Verification. For a protocol specific example, see Structuring an HTTP/2 Request. profile Identifies the Automatic Speech Recognition (ASR) profile associated with your product. AVS supports three distinct ASR profiles optimized for user speech from varying distances. format Identifies the format of captured audio. initiator Lets Alexa know how an interaction was initiated. This object is required when an interaction is originated by the end user (wake word, tap, push and hold). initiator.type Represents the action taken by a user to initiate an interaction with Alexa. initiator.payload.wakeWordIndices This object is required when initiator.type is set to WAKEWORD. ASR profiles are tuned for different products, form factors, acoustic environments and use cases. Use the table below to learn more about accepted values for the profile parameter. CLOSE_TALK 0 to 2.5 ft.
NEAR_FIELD 0 to 5 ft.
FAR_FIELD 0 to 20+ ft. Note: See Audio Hardware Configurations to determine the appropriate ASR Profile for your Alexa-enabled product. If StopCapture will be sent to your client when the end of speech is detected in the cloud. If cloud-based wake word verification will be performed on the stream. This directive instructs your client to stop capturing a user’s speech after AVS has identified the user’s intent or when end of speech is detected. When this directive is received, your client must immediately close the microphone and stop listening for the user’s speech. Note: StopCapture is sent to your client on the downchannel stream and may be received while speech is still being streamed to AVS. To receive the StopCapture directive, you must use a profile in your Recognize event that supports cloud-endpointing, such as NEAR_FIELD or FAR_FIELD. ExpectSpeech is sent when Alexa requires additional information to fulfill a user's request. It instructs your client to open the microphone and begin streaming user speech. If the microphone is not opened within the specified timeout window, an ExpectSpeechTimedOut event must be sent from your client to AVS. During a multi-turn interaction with Alexa, your device will receive at least one ExpectSpeech directive instructing your client to start listening for user speech. If present, the initiator object included in the payload of the ExpectSpeech directive must be passed back to Alexa as the initiator object in the following Recognize event. If initiator is absent from the payload, the following Recognize event should not include initiator. For information on the rules that govern audio prioritization, please review the Interaction Model. This event must be sent to AVS if an ExpectSpeech directive was received, but was not satisfied within the specified timeout window. Warning: This is not the current version of the SpeechRecognizer interface, some features may not be supported. If this isn't what you're looking for, please use the Interface Version Selector to navigate to the correct version. To use version 1.0 of the SpeechRecognizer interface, it must be declared in your call to the Capabilities API. For additional details, see Capabilities API. The Recognize event is used to send user speech to AVS and translate that speech into one or more directives. This event must be sent as a multipart message: the first part a JSON-formatted object, the second, binary audio captured by the product's microphone. We encourage streaming (chunking) captured audio to the Alexa Voice Service to reduce latency; the stream should contain 10ms of captured audio per chunk (320 bytes). The profile parameter and initiator object tell Alexa which ASR profile should be used to best understand the captured audio being sent, and how the interaction with Alexa was initiated. If your product is voice-initiated it must adhere to the Requirements for Cloud-Based Wake Word Verification.